Visual lie. 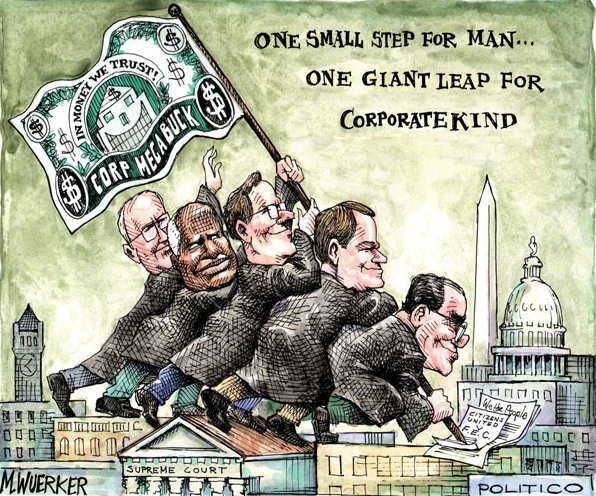 Feingold’s law notwithstanding, the corporate bucks were flooding into politics all along. Still, I understand why you leftist pointyheads are so upset: one of your three stealth attacks on the First Amendmant rights of right-wingers has been blunted. Now you will just have to make do with serial lawsuits and “hate crimes” laws. In time, we will take those down too. Then we will see some real truth told about what ails America. Well, conquerer, we agree that “corporate bucks were flooding into politics all along,” but your conclusion doesn’t follow. Consider a few parallel cases: if one team spends three times as much as most of the rest in the league, is it good for the game if they then go on to spend ten times as much? If the government wanted all of your land, would you buy the argument that they should get it because they had already taken some of it before? If someone said you should take the locks off of all your doors, what would you think of their argument if they said that break-ins occurred all the time anyway? And so we get to your second claim, which is that–despite all the corporate bucks flowing into politics on behalf of right-wing causes–First Amendment rights of right-wingers are under attack. Of course, most of the lawsuits and other measures taken to restrict speech are by corporations, and most hate crimes involve actual violence rather than speech alone, but I’ll let that go. The fact remains that, unless you are planning to commit a hate crime, you can speak right here without fear of recrimination. So, tell me, what is the real truth about what ails America?